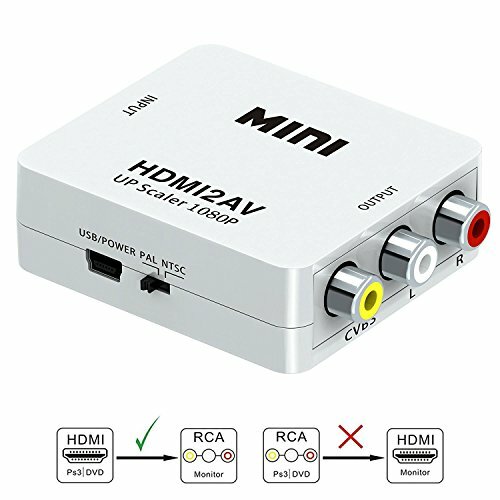 The Mini HDMI to AV signal converter which will convert HDMI video signal or audio signal to AV(CVBS)composite video signal and the FL/FR stereo audio signals, while support DVI system sideline signals. To help users convert the high quality of the HDMI video signal into normal CVBS signal(standard-definition 480i,576i). So that can play on TV,VHS VCR,DVD recorders,etc and support NTSC and PAL two TV format. 1.No need to install drivers,portable,flexible,plug and play. 2.Output the audio synchronization with video. 3.High bandwidth capability support 1920x1080@60Hz. 4.Support NTSC and PAL two standard TV formats output. 1) Video signal transfer only, can\'t improve the video quality, please import HD video. 2) PLEASE DO HOOP UP THE USB POWER CABLE TO 5V POWER SOURCE BEFORE USE, OTHERWISE, THE CONVERTER MAY NOT WORK PROPERLY. 3) The converter is not fit for Fire Stick, Roku, mobile phones and iPad series. Support PAL and NTSC two standard TV formats output; Plug and play without any drivers; Flexible and portable. Please hook up the USB power cable to 5V power plug before use. If you have any questions about this product by GANA, contact us by completing and submitting the form below. If you are looking for a specif part number, please include it with your message.